It was about ten years ago when I sat down with some folks from Norton Abrasives and we came up with the 3X Grinding wheel line. 3X, which is a consumer version of seeded gel abrasives, grinds cooler than pure (AO) aluminum oxide (white) wheels that came before it. Since I have always thought a wet grinder was way too slow, having wheels that I could easily grind with no burning was a great thing. Some people will point out that with a coarse wheel - 36 grit or less and proper wheel dressing - you can cool grind just about anything. This is true. But AO wheels run cooler than older style wheels, 3X runs cooler than AO wheels and now CBN (Cubic Boron Nitride) runs the coolest of all and does not require dressing. Each generation of cooler grinding technology makes it easier and easier for a person to grind to an edge without burning the steel. CBN is a curious little crystal. Unlike vitrified wheels which reflect back the heat of grinding into the tool, or diamond abrasives which react with the carbon in steel, CBN absorbs the heat of grinding resulting in a cooler than ever grind. In the video below I am grinding with an 80 grit CBN wheel, from a flat bevel on a tool to a hollow grind to the very edge, forming a wire, in in a few seconds without needing to dunk the chisel in water (although if you need to grind the chisel a lot you should dunk. The tool will get hot but not nearly as fast as on a regular stone). Part of the reason I can do this is that CBN runs very cool, the other part is that our CBN wheels are very slightly crowned. The crown means that when I freehand grind and don't approach the wheel exactly square, I will still contact the wheel at a known point. This way I don't grind the wrong thing, or grind a corner excessively (and burn it). I have lots more control. I suppose in theory there is less overall contact with the wheel but the entire grinding still takes place in a few seconds. A few controlled seconds. Once the tool touches the wheel I sort of pivot the blade slightly so I am using the entire left or right side of the wheel. BTW I just noticed this in the video - with a crowned wheel when you are taking off a lot of material in the beginning, the crown buries itself in the bevel and as you can see in the spark pattern you are grinding pretty much the entire width of the chisel or at least the half that's engaged. As you come closer to finishing and are at the edge with a light touch you are grinding most at the center with less contact area and less heat. As you can see at this point the spark pattern is a thin line in the middle. Remember of course that if you don't have crowned CBN wheels you can just as easily dress any wheel with the smallest crown you can, and get the same control, ease of use, and lower temperatures. We currently stock 6" CBN wheels, and a CBN version of the Gramercy Custom Tuned Baldor Grinders. We do plan to get 8" CBN wheels and grinders in soon. I would have had them now but my order at the factory got lost :(. It happens. However, as much as I know turners love CBN I am not sure why. The primary reason for an 8" grinder is for grinding turning tools with a minimal hollow grind. I get that and it's fine. However what I don't understand is that most people turning are using high speed steel (HSS) tools which don't really have the sensitivity to burning as do regular carbon steel tools. So in general you can safely grind on a regular grinder and any old wheel with no danger. 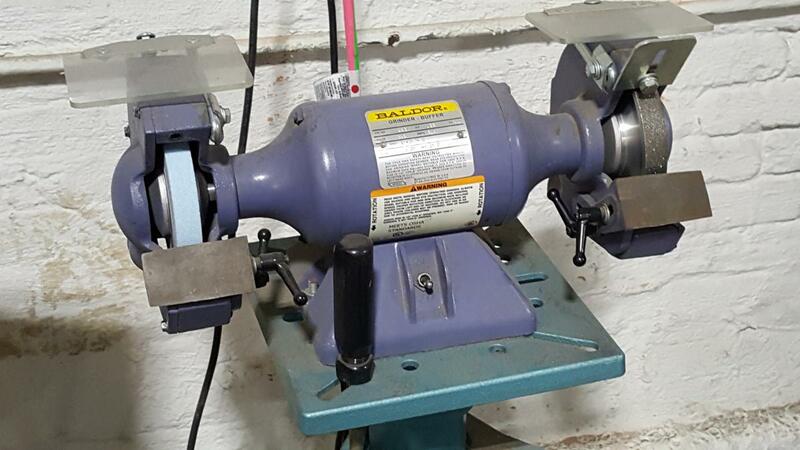 I understand if you want one grinder for both the workshop and the lathe but if mostly what you do is grind edge tools you can certainly grind the occasional turning tool on a 6" grinder. For regular tools a 6" grinder gets you a nice hollow grind, weighs half as much as a 8" grinder, and costs a lot less to purchase and ship. In the picture above and in the video we are using my grinder. That's why the grinder doesn't have one CBN wheel and a stock wheel like our custom grinders and has instead a 3X wheel. My grinder was used as the test for the CBN wheels, the machined flanges, handles, the 3X wheels when we first got them, and all the other hop-ups that we made for our Gramercy Custom Grinders. Having one wheel as CBN and one as a stock wheel saves you money and is actually a better combination because you should not grind non-ferrous metals on a CBN wheel - you can clog the wheel, and having a second wheel (the 3X) just so it runs cooler, doesn't matter except for hardened steel which you will be grinding on your CBN wheel. In my case I was comparing CBN and 3X and haven't had a compelling reason to remove the 3X wheel. Between all our grinding equipment we don't really need an all purpose grinder and my grinder is just for edge tools and any experimentation we want to do. Turners like CBN wheels as they do a lot of touching up and the wheels don't need dressing. Also perhaps many don't know you can blue without harm. BTW the #36 blue wheel is great for rehabbing bench chisels. Thanks! I have a slow speed 8-inch grinder with a ao on one side (whih it turns out I practically never use) and a CNB on the other which I use for all my turning and carving tools. I think it is an order of magnitude better than anything else I have ever sharpened with. two swipes for a gouge and it's done. No need for dunking. It's not hot. I keep the AO for grinding down the length of a bolt or something, metalworking. I posted information about CBN wheels for flat woodworkers on my website about 18 months ago. The grits I recommend is 180 for general use. One can add a 80 grit if doing much restoration grinding. The higher grit wheels (250 and 350) are for turners. The hollow grinds from the CBN wheel are uniform and smooth, and the coolness enables grinding close to the edge of the blade. This facilitates easy and quick (freehand) sharpening. I have often argued that the best sharpening system begins with a hollow grind that maximises all that follows. CBN really delivers here. Further, the wheels last nearly forever (I know some that are going for 20 years), and require minimal upkeep. They do not require dressing, so settings do not alter. The wheels ay be used for all hardened steel. I have used them, without any signs of loading, on O1, A2, PM-V11, M2, M4, D2 and CPM-3V. I like the idea of the crowned wheels you sell. These were not available when I purchased mine, which are square/straight. Don't know where to put this question, so I'm putting it here. I am refurbing "Zada" Polaski's hand cranked grinder. neary 65 years ago I used to do the cranking. The wheel does needs replacement. Everything else is there. Note that this has only one wheel, although I have other drill-operated buffers and stroppers. I can strop on bare leather, have held out one belt for this. Would this wheel be a candidate for a one-wheel, sloooow wheel? I think the last problem to worry about would be heat. The first would be the fact that I've never sharpened on a wheel before. I honestly think it would not be very cost effective. It would work but you would not be getting the major benefit of CBN which is that they run cool at high speed. You would be getting the benefit of no dressing. But is it worth twice the price of a 3X or 10x the price of a regular cheap wheel just to avoid dressing the wheel? I'm studing the market for a CBN system. What I've learned so far is that the CBN wheels do a better job on the new Powdered metal (PM) turning tools which are beginning to replace HSS as the tools sought for by many pros. The smaller grit on CBN does not knock the smaller fibers off the edge and produces a better and sharper edge. That's what I've heard anyway.